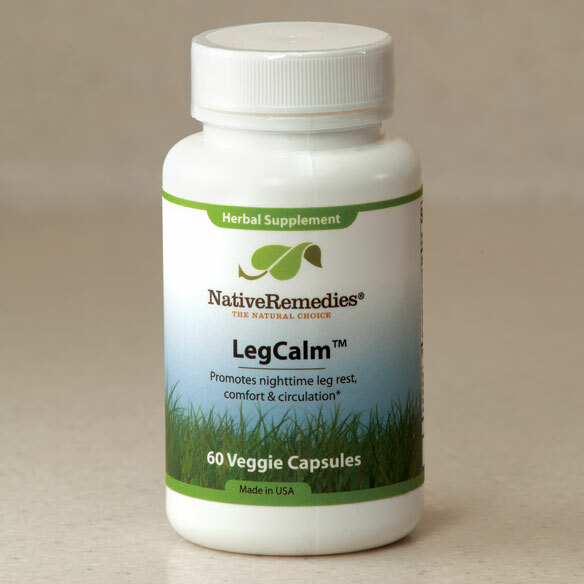 NativeRemedies® LegCalm™ calms restless legs for all-day comfort and a better night’s sleep. These natural supplements supports health and circulation in the legs and helps maintain sleep patterns, without medication’s harmful side effects. Manufactured to the highest pharmaceutical standards. 60 capsules lasts 10– 30 days, depending on use. Legcalm is a 100% herbal formula and contains the following ingredients in therapeutic dosage: Milk-vetch, Butcher’s broom, Horse chestnut. Milk-vetch (Astragalus membranaceous) supports the healthy functioning of all the body’s organ systems through its adaptogenic and tonic properties. This herb supports circulation and the absorption of iron from food as well as supporting the immune system and heart. Butcher’s broom (Ruscus acluteatus) is used extensively in Europe to support circulation, digestion and water balance and as a bladder and kidney tonic. Recent studies have investigated this herb for its ability to support vein integrity in the body. Horse chestnut (Aesculus hippocastum) helps support healthy blood circulation throughout the body, including the legs. Adults & Children 12+: Take 2 capsules 3 times daily after meals for approximately 1-2 weeks. Children 6-11: Take 1 capsule 2 times daily for approximately 1-2 weeks. Special Instructions: After initial 1-2 weeks, reduce dosage to ½-1 capsule 2-3 times daily after meals for maintenance. Caution: Not recommended for children under six years old unless under medical supervision. Safety during pregnancy and breastfeeding has not yet been established. If symptoms persist or worsen, consult a health care professional. Keep this and all medicines from the reach of children.